If you obeyed the instructions on most seed packets, you'd plant your herbs and vegetables too thick, then come back through and laboriously thin out the seedlings that sprouted too close together. I don't do that. Not only are you throwing your money away when you thin out seedlings, you also have to either put them somewhere else or endure the heartbreak of composting a perfectly good plant. But if you plant your seeds the proper distance apart from the get-go, you often end up with patchy germination. (Or, in this case, the cat scratches up a third of the bed soon after the seeds sprout and kills them.) My solution is to transplant a few seedlings from an area where the seeds fell too thickly, using those extras to fill in empty spaces. To be able to transplant seedlings into those gaps, I do seed a bit thicker than necessary, but only a little --- not so much that if everyone comes up, they'll be overcrowded. I'm also careful to transplant when the seedlings are very young. The parsley plants shown here are really too old to transplant --- my goal is to be able to scoop up all of the plants' roots and not disrupt their routine at all when I move them into the gap. That said, there are times that I purposely seed too thickly and thin. Carrots seem to be a bit problematic to germinate if the soil is hot and dry, so I often spread the seeds pretty thickly on the soil surface. 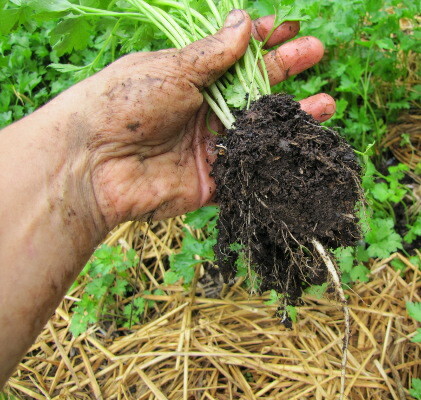 Once the roots are just barely big enough to eat --- half an inch in diameter or less --- I start harvesting the carrots that are too close to their neighbors, carefully wiggling out dinner without bothering the keeper plants. That way, I get an extended harvest and ensure that the main crop of carrots isn't overcrowded as the plants mature. One final factor to consider when you're thinking about thinning is the longevity of the crop. 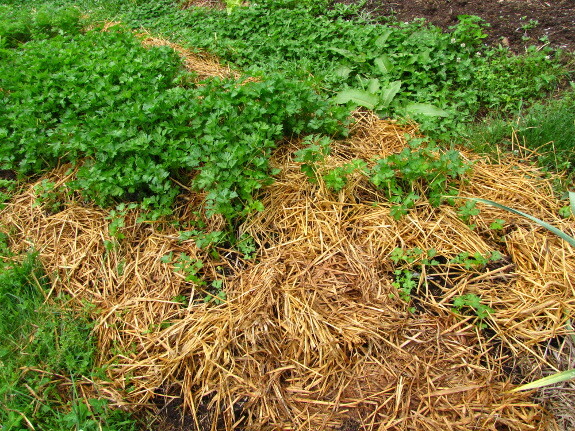 Since we eat our parsley plants for about eleven months, it's worth making sure they cover the bed well (and something like asparagus that will feed us for years is even more worthy of transplanting). But if my lettuce bed is a bit patchy, I just ignore it --- I'll be ripping out the bed and starting to eat a new patch of salad greens within a month. Our chicken waterer is always POOP-free. Jen --- Thanks for sharing! I'll have to take a look before the fall garden protection season rolls around again. Have you tried Steve Solomon's suggestion on carrot germination problems? Cook up some corn starch and then cool it in the fridge. Mix in your seed the next day, put in plastic baggie and cut off the corner. The "gel" keeps the seeds moist during that essential germination period. I'm not thrilled at wasting a baggie but the germination rate, for me, went from almost nothing to 90+ percent. Worth a shot and some cornstarch if you ask me. c. --- I may have to give that a shot. I'll bet it would be handy with the seedlings we have the most trouble germinating --- beets and spinach. Our carrots aren't usually enough of a problem to be worth transplanting, especially since root crops don't like having their feet messed with. Whoops. I may not have been clear. That's straight seeds that go in the goo, mix the goo/seed ratio and practice a bit to get spacing right. More goo or smaller hole cut in baggie = wider spacing and then plant in place. The cornstarch goo keeps things moist enough for a higher germination rate. I'm still not entirely sure I understand the specifics --- sounds like I need to check out more of his books anyway.